On a handful of occasions, I have encountered an interesting phenomenon in conversation with some citizens of the Republic of Kazakhstan. This anomaly occurs when the discussion turns to my subject of research for the first time: the Kazakh/Jüün Ghar wars of the 1720s, part of the long-term struggle of the 17th and 18th centuries, commemorated under the phrase Ak-taban-shubryndy. This phrase, however, doesn’t always point the listener to the Kazakh – Jüün Ghar wars. Rather, when I have explained that I study the Aktaban Shubyryndy, my conversation partner may nod knowingly and respond with something about the importance of studying the great famine (sometimes the term “genocide” arises) of collectivization that occurred in the early 1930s. The first time I was surprised by the swift jump through two centuries, but after some reflection, the conflation of the two events is perhaps more telling than confusing. The study of the famine in Kazakhstan is connected with the study of the arguably more famous Holodomor famine (literally “kill by starvation,” though other terms have been suggested in its place: “terror-famine” or “famine-genocide”) in Ukraine, which killed many more people, though fewer when taken as a percentage of the total population. Part of the struggle to connect these famines is the offset timeline, since the famine in the Kazakh steppe occurred first and recovery had already begun when many in Ukraine were facing the worst periods of death and starvation. The practice of collecting, editing, and then publishing data in this way reminds me of a similar practice found in the study of China, where local records were edited and collated at the regional level before ending up in large country-wide collections, meaning that at least three versions of the events are available: the relatively unprocessed events, the events processed somewhat to please the central government, and then a version stamped with the central government’s approval. Though, to be fair, one could consider all professional historians as practicing a variety of this same occupation: collecting data from official repositories (archives, museums, etc.) before editing and collating that data for a publisher or peer-review panel, which then passes the work onto the masses. РГУ ЦГА КФДЗ Арх. № 5-3400. Drawing of zhut in Pavlodar Oblast, 1914. In Tynyshpaev’s work on the Bare Footed Flight from the 1920s, he draws several comparisons between the suffering of the 1720s with that found among the Kazakhs during the 1910s, especially during the 1916 uprising, the attempts of the Russian government to control population, and the Russian Civil War. Some of these tribulations were exacerbated by naturally occurring zhut. Tynyshpaev presents folk wisdom in such times when the herds dwindle to nothing, the people can survive by milking birch trees and eating certain bitter roots and shrubs with some meager nutritional value. Indeed, part of the argument of my dissertation is that the Bare Footed Flight resonates with Kazakhs precisely because of the recent history of famines. 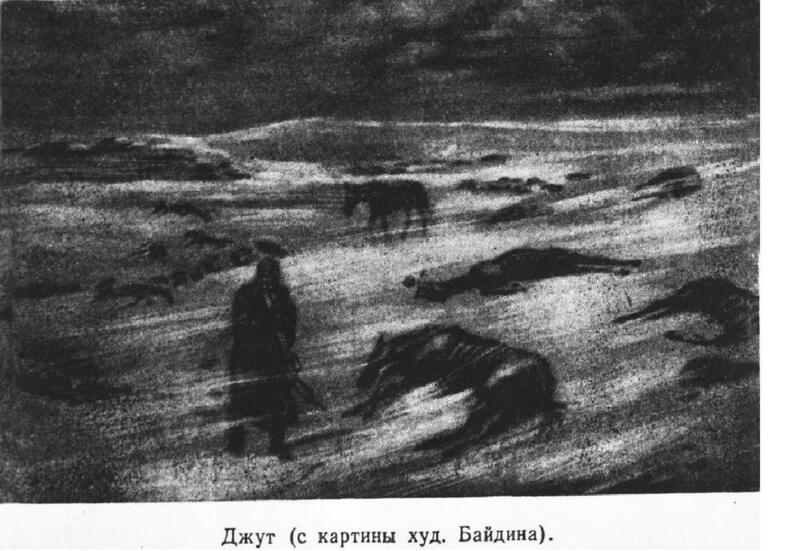 The end of the nomadic way of life coincided with depopulation through starvation and emigration — the importance of which is somewhat sidestepped by finger-pointing and the suggestion of Soviet genocidal campaigns against non-Russians, despite the body of evidence that Russians suffered mightily alongside the Kazakhs and Ukrainians, and even more so during the dehumanizing horror of the war with Hitler’s Germany. I should mention that the term zhut, like so many terms in Kazakh, is a cognate in modern Mongolian–zud in Mongolia, jud in Inner Mongolia. However, there seems to be little inter-cultural discussion on the topic in economic and social history — as witnessed by the completely unrelated articles on the subject in Kazakh and Mongolian language on Wikipedia. This is not so surprising, considering the following. Kazakh and Mongol are far from mutually intelligible languages, despite their large body of shared vocabulary–one could mention here that increasing scholarship in linguistics has led to a widespread challenging of the genetic relationship of Turkic and Mongolic languages (under the umbrella labeled Altaic) in place of the convergence of unrelated languages due to centuries of contact. Kazakhstan, like so much of the Turkic part of Central Asia, developed away from nomadism into a sedentary-focused society under the Soviet Union. While a Communist satellite state of the Soviet Union, Mongolia did not undergo the same brutally effective sedentarization campaigns witnessed in Kazakhstan, Uzbekistan, and Turkmenistan. In Atwood’s Encyclopedia of Mongolia and the Mongol Empire, he writes that 35% of the rural population remains involved in nomadic herding. My point here is not to undermine the suffering faced by Mongolians, of course. Rather, a simple comparison shows that unlike Mongolians, the other nomadic populations of the Soviet sphere saw an almost simultaneous transition through collectivization and then sedentarization onto collective ranches/farms and village/agricultural settlements. The overall affect on the culture and perceptions of history in Kazakhstan has created a hazy, golden era of nomadic plenty ruined by Soviet barbarity and the auguries of fate represented by zhut. In other words, an observer of Kazakh history in the 20th century can choose between blaming the callousness of Russians or blaming the weather, both being seemingly beyond the control of the individual Kazakh. This is not so different from the situation in the 18th century, where one explains the Bare Footed Flight’s horrors by blaming either the zhut preceding it or the wiles of the Jüün Ghars (or their shadowy Chinese masters, in Soviet-Kazakh imagination). In other words, it is no wonder that one could conflate the two events. They are intrinsically interwoven in the history of the Kazakhs by the bitter experiences embedded in the memories of their survivors as preserved (narrated, delivered, if not embellished) for their children. 1 Pianciola, Niccolò. “Famine in the steppe. The collectivization of agriculture and the Kazak herdsmen, 1928-1934,” Cahiers du monde russe 45, no. 1-2 (2004): 137-192. 2 Wheatcroft, Stephen. 1997, “Soviet statistics of nutrition and mortality during times of famine. 1917-1922 and 1931-1933.””Cahiers du monde russe 38, no. 4 (1997): 525-538. 3 Ohayon, Isabelle. “The Kazakh Famine: The Beginnings of Sedentarization.” In: Online Encyclopedia of Mass Violence, [online], published on 28 September 2013. 4 Cameron, Sarah. The Hungry Steppe: Famine, Mass Violence and the Making of Soviet Kazakhstan. Manuscript in progress. 6 Perhaps from German writer Kurt Tucholsky, who wrote in 1925 Französischer Witz. A French diplomat is represented as saying, “Der Tod eines Menschen: das ist eine Katastrophe. Hunderttausend Tote: das ist eine Statistik!” [“The death of one man: that is a catastrophe. A hundred thousand deaths: that is a statistic!”] (Tucholsky, Gesamtausgabe, Band 7, Text 136, page 375). 7 On a side note, it seems this may be an instinct not seen across all breeds of horse. In the American West, the Mustang derived from horses brought over by the Spanish — usually classified as “Iberian,” though a mix of North African breeds. Reading about the Comanche and Sioux, it appears that one problem preventing the rapid spread of horse culture to northern Amerindian populations was finding fodder. From this I conclude that perhaps the Iberian horses were not able to feed themselves sufficiently by finding grass under snow using their hooves. Next Why are you studying the Kazakhs?